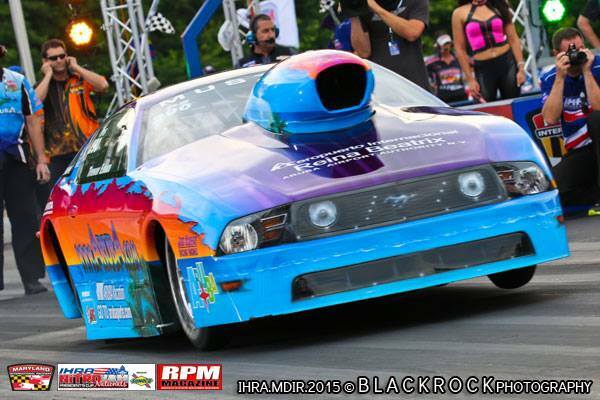 MARTIN, Mich. (August 12, 2015): The IHRA Nitro Jam Northern Nationals started off well for Team Aruba. After a satisfying day of testing on Thursday, the Aruba.com Mustang came out ready for action in Friday qualfiying and was sitting number two with a 6.314 pass at the end of the day. Qualifying continued on Saturday. As cloud cover cooled temperatures, the competition picked up their pace, and Team Aruba was bumped back to fourth in qualifying. However, this still put them in the top half of the ladder, earning them lane choice for eliminations. Trevor Eman and Team Aruba were paired with reigning champion Cary Goforth for round one of eliminations. “In the course of the day the sun started to come back out,” Eman began explaining, “and I must say I think we underestimated how quickly the track will heat up with the sun shining on it. We made what we felt were the necessary adjustments to tune down the car for the hotter weather and heated track. Unfortunately our adjustments weren’t what the track required to get down. “We experienced severe tire shake. However, Cary did as well. It became a gas peddling match down the track. One where Cary would pass the finish line first. Although Eman was clearly disappointed with their results from the Northern Nationals, the team did run and qualify well, which gives them momentum to build upon for the next event, the IHRA Nitro Jam San Antonio Nationals, September 25-26. “That unpleasantness only sticks around for a short time,” Eman added. “As soon as the race car is put away and the emotions settle, you realize that you are surrounded by a team of guys who also are ready to get back to it shortly after everything settles to normal. The Eman family and Team Aruba crew are always welcoming of fans and love the opportunity to talk about the island paradise they call home. “We’re happy to have been hosted by US 131 Motorsports Park, a top notch facility where we are always treated like family. Too bad we don’t get to visit such venues more times per year. The IHRA did a great job completing this event, which was also plagued by rain showers. They were able to complete both the Budds Creek event and this event.